If you like running or cycling but not a huge fan of doing it all outdoors, you can of course take that workout action indoors. We know treadmills and indoor bikes have served us pretty well for those training sessions when you don't want to brave the cold. 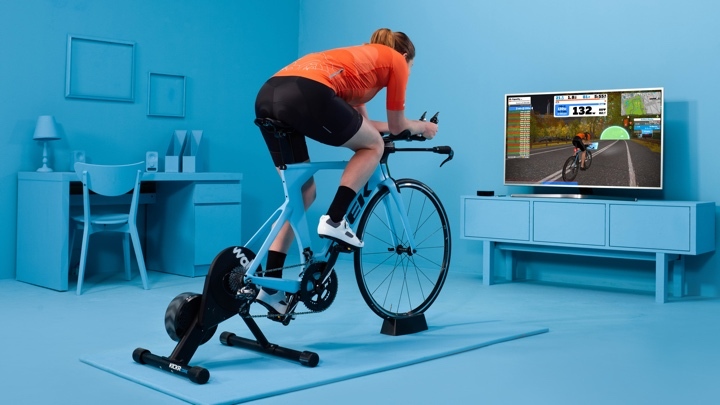 But Zwift wants to make that experience a more motivating and competitive one. The online fitness platform that lets you cycle and run in a virtual world has been around for a few years now. While previously a cyclist-only domain, its virtual doors have now been open to runners too. If you're thinking Zwift could be a good option for you or you just want to know a bit more about how it works and what you need to get it set up in your home, we've pulled together this little guide on all the important things you need to know about getting into Zwift. Before we get into the kit, we should mention that Zwift's cycling mode works on a subscription basis. So you'll have to pay $14.99 a month to access it. Zwift does offer a 7 day unlimited distance trial and you don't have to input your credit card details to do the trial. For runners, it's free to use right now, but there's likely to be a subscription service introduced for that mode too in the future. Your account will work across platforms. So if you use it on your Apple TV but also use it on an Android phone, it will work and carry over your data. A turbo trainer or rollers. Smart trainers, such as certain models from Wahoo, Bkool, Elite or Tacx, will transmit all power and speed data to Zwift. If you have an older trainer, you can connect via an ANT+ or BLE power meter, or a speed and cadence sensor and it will estimate your wattage for you. A PC or Mac, Android or iOS device or Apple TV. A bridge receiver for the ANT+/BLE signal. You can check for a full list of compatible kit over on this Zwift page. Once you are set up and ready to ride, the first thing Zwift will ask you is to pair your devices via Bluetooth. This is all straightforward, and onscreen prompts, via a helpful squirrel, will assist you if you need help. Once they are paired you won’t need to pair them again. Your choices are: Power source (your smart trainer if you have one, which will connect via Bluetooth) or your speed sensor. Optional extras are heart rate, via a heart rate monitor chest strap or wearable, and cadence via ANT+. Both are not essential, but if you have them, it will result in a more immersive experience and more accurate data. Some in-game events require you to have these to receive an official final position/podium place too. Once you’ve paired what you need to, simply click Ride and you are almost ready to get to pedalling. Next is picking where you want to go riding. You’ll see this screen (above) next and from here you can opt to ride on the Guest World Schedule course, which, in our testing time, rotated between real routes in New York, London, Richmond and Innsbruck. You can even climb Alp D’Huez once your skill level gets to level 12 or Zwift’s fictional world of Watopia. Cofounder and CEO Eric Min says that “Watopia is really the home of Zwift”. It features a huge variety of riding terrain and geography, including leg-sapping mountains and volcanoes to climb, and flat beach fronts to spin your legs out along. Once you have decided where you want to ride, you are then presented with a choice of routes, with varying lengths and ascent. There are more routes to unlock the more riding you do and levels you progress through. If you want your rides to be more structured, there is a training plan option, which will help you train towards a specific target, whether that’s building endurance for a gran fondo or increasing your VO2 for races in the real world. There’s an array of different types of plan, of varying lengths and intensity, and you more to unlock as you progress. Within these training plans you can also participate in workouts that will tell you your functional threshold power (FTP). This is the average power you can produce, in watts, over an hour. It’s important to find out what yours is as Zwift uses it to shape your training zones. The only thing is, taking the FTP test is notoriously hard work – a sufferfest, but a necessary sufferfest. Zwift itself doesn’t have many traditional ‘video game’ elements to it – it’s more about pure riding and training. But you are rewarded for your achievements by unlocking extra levels and the ability to customise your character. As you progress in skill and speed, you can access more shirts and kit to add to your character. It’s one of many clever ways to entice you to push yourself harder than you may otherwise have done. This is a separate free smartphone app (iOS and Android) that’s worth downloading as it helps you locate your friends when you want to meet up with them in the virtual Zwift world. You simply click on the Zwifters you follow, pick the ones you want to ride with and you will automatically move next to them in the game. The app notifies you every time your friends are using Zwift, meaning your motivation to ride is higher, you can use it to find out about, and enter, upcoming events and it also works like a remote control to operate the game from your bike. You can sync Zwift to your Strava account at the click of a button. This means your workouts are directly uploaded to the activity tracker’s site, complete with a screenshot from your ride. There are even Strava segments in the virtual world, so you can track your progress by how many trophies you get. If you want to link Zwift to Strava, there's a couple of ways to do this. The first is head to Zwift.com, log into your Zwift account and go to Settings. Look for the Strava logo and click. This will prompt you to log into your Strava account to complete the link. You can alternatively do this via the Zwift Mobile Link app for your phone. Go into the Settings menu and again look for the Strava logo to log in and connect the two platforms. You'll know it's been successfully done when the Strava logo is in color. Zwift launched into the world of running in 2018 in an effort to transform your treadmill-based training from uninspiring ‘dreadmill’ sessions to something significantly more exciting and motivational. As mentioned, it's also free to try (for now). The idea is, unsurprisingly, very similar to Zwift Cycle: the only bit of tech you need is a Zwift RunPod (or other smart running sensors such as ones from Garmin, Stryd or Polar) to attach to your trainers, which works out your cadence and transmits it to your mobile device or tablet via Bluetooth. As with cycling, a heart-rate monitor is also handy but not essential. It will also link up with Strava, so you can pull your virtual running exploits into the sports tracking platform. Once you have downloaded Zwift Run (currently available on iPhone, Android, iPad, AppleTV or Mac/PC) and logged on you arrive at the same screen as Cycle, and you can toggle between the sports to pair your RunPod, heart-rate monitor and treadmill (if it has the capabilities). You can also calibrate your RunPod so it gives a more accurate speed reading by clicking on the spanner icon below the Run Speed connection once it is connected. If you want to just run, simply choose one of the pre-programmed routes of varying distances and undulation on Watopia or the guest world. Zwift has now also introduced running routes where you can ditch the cyclists too. Alternatively, if you want to work towards a certain goal, pick from one of the many training plans such as ‘Footwork Intervals’ or ‘The Hills Are Alive’, which you complete over a certain number of days or weeks, or join a group run. It's still early days for Zwift's running platform, but you can expect more features to be added in the future.